When it’s time to melt away the pounds, swimming and aquatic exercise delivers. But, finding the opportunity to swim isn’t always easy. Luckily, a swim spa is an easy solution, with space to swim and work out at home. Here are 3 benefits to using the swim spa for weight loss. Burn Calories Without Straining Joints When exercise on land is difficult or painful, a swim spa is an easy way to get a low impact workout without straining. Buoyancy takes pressure off the joints, making movement pain free and effortless for a better, more productive workout. Strengthen Muscles for Faster Weight Loss Water has natural resistance. That means any movement you make while submerged tones muscles and joints. With a swim spa, strength building features can be added easily, like resistance bands, rowing kits, and even ankle fins. Workout and Relax Modern swim spas offer the best of both worlds. Many can be equipped with a hot tub at one end and a non-stop current for swimming at the other. After a tough workout, slip over to the spa to relax, rejuvenate and refresh. 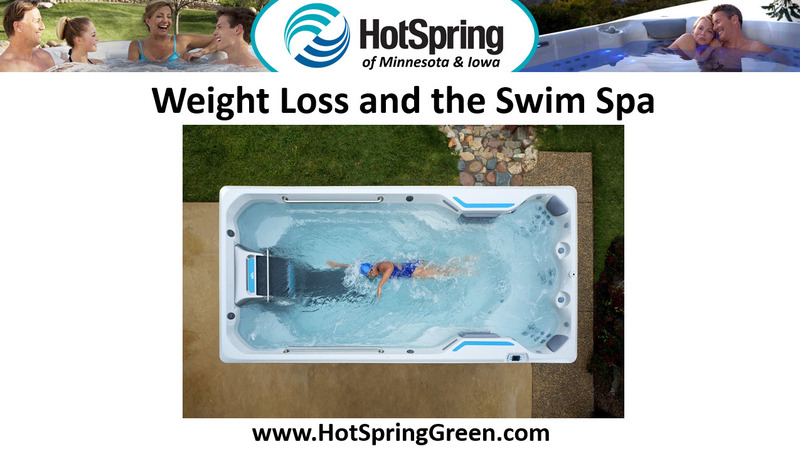 To encourage local residents to check out the benefits of using a swim spa to help improve their overall health and well-being, Hot Spring Spas is providing free swim spa test soaks at all their showrooms.